If you’re suffering from Apple MacBook Air or Dell Adamo XPS cravings this just might be your lucky day. Meet the Dell Vostro V13 – it’s a 16.5mm thick 13-incher that brings very much the same specs as the Dell Adamo XPS, but at a netbook-scale price. Okay, I’ll admit that the XPS 9.9mm thickness for a laptop sounds (and looks) amazing – it can even put most smartphones to shame. But the price is just too hard to swallow. The Dell Vostro V13 on the other hand is actually reasonably priced… though it’s only available in Singapore right now. Which isn’t a big deal, considering it’s not quite official yet (though it’s up on the Dell Sinagpore website, specs and all). First off, things are not quite as rosy – 16.5mm is just the thinnest part of the of the Vostro V13, at its thickest it’s 19.7 mm. But that still is only a hair thicker than the MacBook Air. Anyway, let’s see what we get for our money. 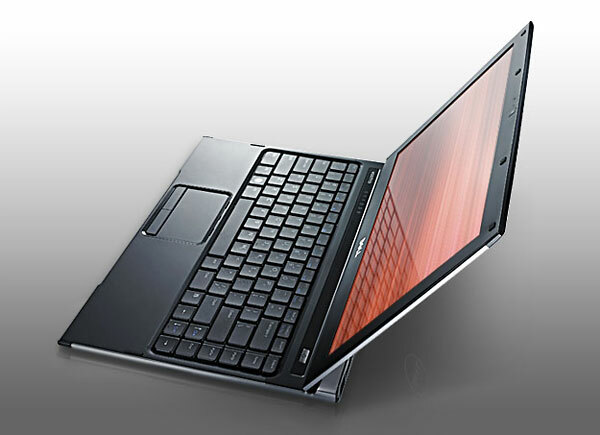 The Dell Vostro V13 is a 13.3″ laptop with 1366 x 768 pixels resolution (the MacBook Air has 1280 x 800). For the CPU you have a choice between Intel Core2 Duo SU7300 (1.3GHz, 3MB L2 cache), Intel Core2 Solo SU3500 (1.4GHz, 3MB L2 cache), Intel Celeron 743 (1.2GHz, 1MB L2 cache), all of them of the ultra-low voltage variety (the Adamo XPS has Intel Core2 Duo 1.4GHz ULV CPU). So far so good. The Dell Vostro V13 also sports goodies like up to 4GB DDR3 RAM 1066MHz, 802.11n support, gesture-controlled touchpad, 2 USB ports, one of which is a USB/eSATA combo, 34mm ExpressCard, 5-in-1 card reader, 1.3MP webcam. For the OS, the choice ranges from anything from Ubuntu Linux, through Windows Vista Home Basic to Windows 7 Home Premium or Professional. The graphics are a bit disappointing – Intel GMA 4500MHD. The same holds for the storage memory – there is no SSD option. Not that you can put “SSD” and “cheap” in the same sentance. And obviously you don’t get an aluminum body or the touch-enabled latch that opens the Dell Adamo XPS. Still, the Dell Vostro V13 price is only 450 US dollars, so the non-aluminum body doesn’t seem like such a loss. That price will probably be valid only for the Intel Celeron Ubuntu OS version. Since the Vostro V13 is still not announced properly, the price situation is a little unclear.